Japanese Episode BW 008: "Darumakka and Hihidaruma! The Secret of the Clock Tower!!" American Episode 1408: "Saving Darmanitan From the Bell!" Satoshi and his friends are eating by a river one day when a pair of Darumakka come and steal their food! Satoshi's Mijumaru is injured in the ensuing scuffle, so Satoshi takes it to the Pokemon Center in a nearby town for treatment. There, Joi tells them that the Darumakka they came across are known for stealing food from the citizens of the town but that nobody knows why they're doing it. Later, when going into the Pokemon Center's storage room to get snacks, Satoshi and the others see that the same Darumakka have struck again! This time, our heroes follow the Fire-Type pokemon and discover that they've been using the town's old clock tower as their base. With the help of their pokemon, Satoshi and his friends climb to the top of the tower and find a Hihidaruma holding up the tower's massive bell with its Psychic powers! Our heroes realize that the Darumakka had been stealing food to give to the Hihidaruma so it could have the energy needed to prevent the bell from falling and potentially bringing the rest of the clock tower down with it. After finding the hook that had originally held the bell in place, our heroes use their pokemon to help reshape it and return it to its original position. Now that the bell is no longer in danger of falling, the Hihidaruma is able to rest and the Darumakka no longer have a reason to continue stealing food. Fans of this franchise typically look at the first filler episode of a series as a litmus test for the rest of the series, as if these unimportant episodes are somehow any indication of how the rest of the show will turn out. It's too bad that isn't actually the case, however, because I really like this episode (OH SNAP BEST WISHES! BUUUUURN!!!!!). I think the thing I liked about this episode is one of the most superficial things about it - the art. Yes, story is infinitely more important, but at the same time I always recall the art of this episode first and foremost whenever I think back to it. You can tell a lot of care went into the design of the unnamed city in which this episode takes place, and the various ways the colorists play with lighting - be it during the scene in the Pokemon Center at dusk or with all the fire stuff inside the tower - really make the episode stand out. I'm not a fan of the aforementioned fire now that it's all being done in CG, but the fantastic art everywhere else in the episode makes it easy to forgive. This episode also features a nice balance of characters, with all of Satoshi's and Dent's pokemon contributing to the plot in some way. Episodes in which every member of the cast has a role to play are rare, so I think it's important to congratulate those that actually do make the effort to include everybody. This episode is also the first episode to air since the death of Shudou Takeshi, the man who, among other things, is credited with coming up with the Rocket trio. The Best Wishes! series marked a drastic change in the characters he created, and as far as I know he never gave his opinions about them one way or the other. Do we even know if he was still paying attention to the show in the two months before his death? Would he have liked them or hated them as the series went on? I think different fans have a different idea of what his reaction to the trio would be - those who like the BW trio will probably argue that he'd love the direction they're being taken in while those of us who don't will argue the opposite - but since he passed away so early in the series we'll never know. In any case, this episode establishes that there are already Rocket agents in the Isshu region and that Musashi and Kojirou are not above stealing Yamato and Kosaburou's "order food at a cafe" shtick. These early Best Wishes! episodes are kind of interesting to me, musically. The series wasn't using any of the older music - so no original series, Advanced Generation, or Diamond & Pearl stuff - but it also hadn't gotten as reliant on the older movie stuff as it would get later on, either. I'd say a good 50% of the music used in a later Best Wishes! episode came from one of the movies, but back in the early days we had mostly TV stuff. It gives it a unique feel that sets it apart from the rest of the series, and I think that's pretty cool. The English dub is actually really quite good. The voice acting and the music replacements are still issues, of course, but there aren't really any changes to the script worth mentioning so it's not terrible. It's a boring episode, edit-wise, but a boring episode edit-wise means a more faithful dub so I'm OK with that. The Darumakka keep their Japanese voices. Let's talk about Darumakka and Hihidaruma for a moment. Pokédex: "Darumaka, the Zen Charm Pokémon. When asleep, even when pushed or pulled, it cannot be knocked over." 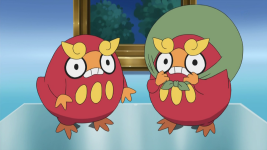 Darumakka (with two k's; I have no idea why TPCI spells the name with just the one, it doesn't make any sense) are based on daruma dolls, red and white good luck charms which themselves are based on Bodhidharma, the man who introduced Zen to Buddhism. Daruma dolls are hollow charms usually made out of papier-mâché that have weights on the bottom of them to prevent them from tipping over. When you buy a traditional daruma doll, the eyes are missing, and the idea is that you draw in one of the eyes when you set out to accomplish some goal and then fill in the other eye once you've completed said goal. Politicians in Japan will famously buy a daruma doll during their election campaign to help bring them good luck. Why they waited until the region based on the U.S. to introduce such a Japanese pokemon is beyond me. In the Japanese versions of the Pocket Monsters Black & White games, the pokemon is known as the "Daruma Pokemon." In the English versions, however, it's the "Zen Charm" Pokémon. I suppose the change is understandable since "zen charm" probably tells your average Westerner a lot more about the pokemon than "daruma" does. Both Darumakka and Hihidaruma probably gets their Fire-Type from a ceremony known as the Daruma Kuyou (だるま供養). During this ceremony, people hand their two eyed daruma dolls back over to the temples where they got them and watch as they are then thrown into a massive bonfire. There are other connections between daruma dolls and fire as well, such as their red coloring and the fact that the word for "fireball" in Japanese is hidaruma (火だるま). Hidaruma...Hihidaruma...I think the connection is pretty clear. 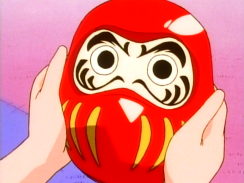 Now some of you may remember that a daruma doll appeared waaaay back in an early episode of the original series. In Episode 084 of Pocket Monsters, "The Airship's a Hardship!? 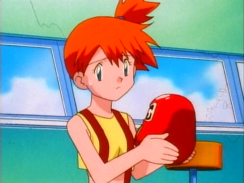 ", Kasumi mistakes this daruma doll that's just laying around in the blimp for her Togepi. 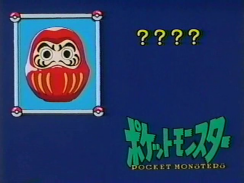 The dub doesn't explain what it is, most likely because it's on the screen for such a short amount of time, but Japanese audiences would have instantly recognized it as a daruma doll. The item was even used as the "Who's That Pokemon?" segment for the Japanese version! In the English version this got changed to Vulpix. Knowing all of this isn't crucial to understanding this episode of Best Wishes! but I do think it makes things a bit more interesting! One, the dub's pronunciation of "Darumaka" does the standard American thing of putting the wrong emPHAsis on the wrong sylLAble. The dub pronounces the Pokémon's name Dah-ROO-makka when in Japan it's pronounced without the emphasis in the middle there. The modes its evolved form can change into got name changes as well. In the English version of both the games and the TV series, Darmanitan can turn into either Standard Mode or Zen Mode. In the Japanese versions of the games, it goes from "Normal Mode" (ノーマルモード) to "Daruma Mode" (ダルマモード). But! In the animated series, these names get changed to "Active Mode" (活動モード) and "Meditation Mode" (瞑想モード). I'm not sure why the TV series in Japan uses a different name for these forms than what's used in the video games, but if I had to guess I'd say it has to do with how the whole "HP dropping below half" thing would have limited the writers of this episode story-wise. 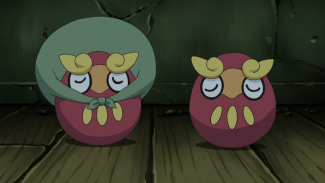 They wanted Hihidaruma to stay in its "Daruma Mode" even after it had recovered its health, but if they had kept the Ability as-is then they would have had to follow the rules of the game and have it revert back as soon as it eats the food the Darumakka had brought it. Changing the name allows them to bend the rules and, if someone tries to call them out on it, they can claim that it's not technically the same thing. And finally, I have to say that Cilan's "...the heat from Darmanitan's flame sac is leaking out" is probably one of the most disturbing lines this dub's ever produced.